As The RSC open their Henry V at London's Barbican Theatre, here is my 4* review of that production from its opening at Stratford upon Avon in September 2015. 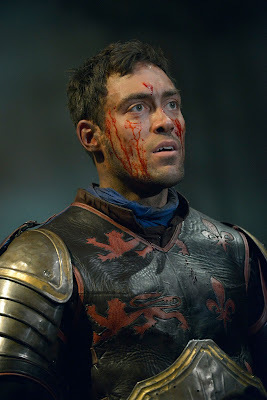 And this link is to my interview with the company's rising star, Alex Hassell. Famously seized upon by directors as a platform for political comment, Henry V has often been rolled out as a platform (sorry, make that a bandwagon) to voice opinion upon contemporary conflict. On screen Olivier’s Harry sought to rally the nation as the 1944 Normandy landings loomed, whilst in 2003 as war raged in Iraq, Adrian Lester’s dusty jeep sped onto the Olivier stage, drawing Nick Hytner’s line in the sand as he acceded to the National’s directorship.